Cut the brinjals into bite size pieces and put it in the water. In a broad vessel put besan, red chilli powder, coriander powder, turmeric powder, salt and few curry leaves chopped finely. Mix well. Take out the brinjal pieces from water and put it in the besan and mix it well. Sprinkle one or two tablespoons of water and again mix it well and keep aside. In a non stick pan add oil and heat it. When it is hot add aniseeds (sombu) and fry for a second. Then add curry leaves, red chillies and green chillies (slit it into two or three pieces) and fry for a second. Add chopped onion and fry till it become transparent. Finally add the marinated brinjal pieces and stir well. Cover with a lid and cook on low flame stirring now and then till the brinjal is cooked well. 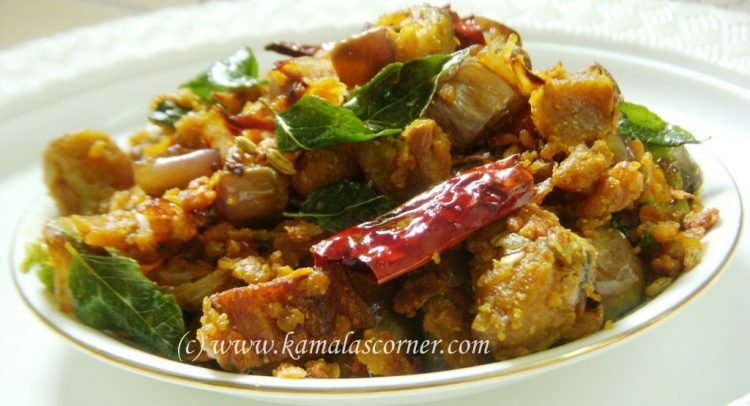 Hi Kamala, I tried Brinjal Pirattal today for lunch, came out well and tasty, it is a good side dish for sambar rice/curd rice. Thank you Manjula for your kind feed back. Easy recipe and well worth trying. Thanks Kamala. every dish looks yummy………………….thanks a ton.will try and post feed back…………..am sure it will turn yummy……. Thank you Vibha for your kind words. Pl try the recipe and post your feed back. Thanks kamala for such an interesting and tasty recipe . loved it a lot .